Get the power of My Playbook on any website you visit. Instantly see if a player is available in your league. Click a player's name on any site, to see up-to-date news, notes, and stats. Quickly navigate to add players to your team. What is the Research Assistant? The Research Assistant helps you take the power of My Playbook to any website you visit. 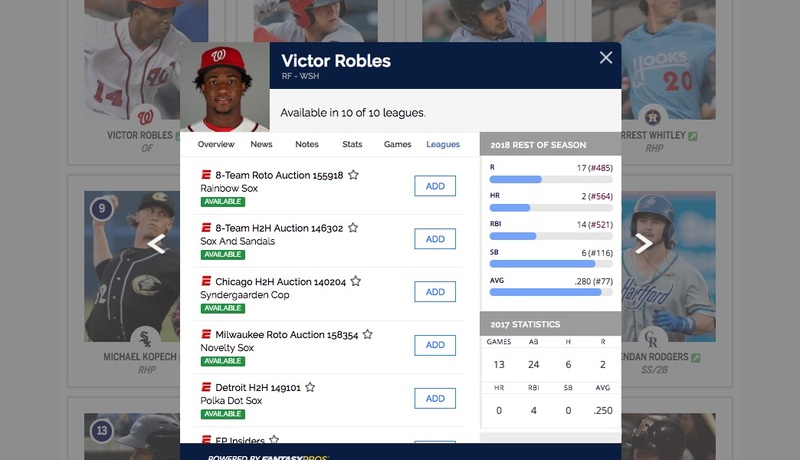 Run the tool on any website that contains MLB player names, and you can instantly see if a player is available in your fantasy baseball league. You'll also have one-click access to FantasyPros' player cards, that contain up-to-the minute news, notes, and stats for each player. How do I install the Research Assistant? The Research Assistant is a browser bookmarklet, which means there’s no software to download or install. In fact, installing the Research Assistant is as simple as dragging the tool to your bookmarks/favorites bar. You can then use the Research Assistant on any website you visit, simply by clicking on the bookmark. The Research Assistant is a browser bookmarklet, which means there's no software to download or install. In fact, installing the Research Assistant is as simple as dragging the tool to your bookmarks/favorites bar. You can then use the Research Assistant on any website you visit, simply by clicking on the bookmark.